The cat jumped over the moon! Go to Illustration Friday to see the other entries here. I left a comment and it poofed! What a nice surprise to see a new post from you. The landscape is very cool. I want to see striped land! i like the cats white belly mirroring the moon and his shadow on the ground. Isn't that how the *original* nursery rhyme goes? No? A-ha-ha! Well, I love it nonetheless! Suki's comment is PURRFECT! Love the cat and the landscape. I thought this adorable painting looked familiar! And yes, that is how it goes. Wishing you a colorful funfilled restful weekend, Laurel. This is so cute. So you. Sure, why not? Cat's are better jumpers than cows anyway. I'll have to ask Jack,,but I'm sure you're right. 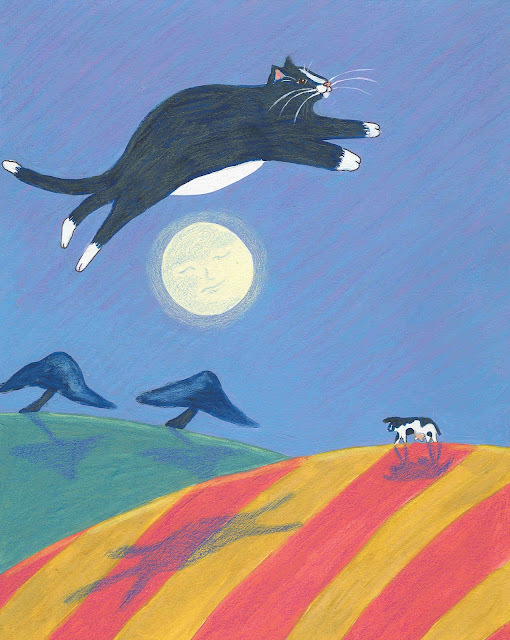 I see cats jumping over the moon all the time, don't you? Cute. Now THIS makes more sense! Cows are terrible jumpers! Wonderfully colorful & cute! Thumbs up! Had to laugh. The moonlight is shedding a brilliant glow on kitty's belly. haha! it does look that way! This is the blog patrol. Time for a new painting. i'll see what I can do, kazoo! Cats jump over the moon in my world too. Love the colors and whimsy here. Wonderful!